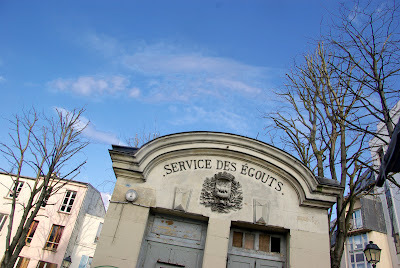 Paris, the city where even the sewers maintenance service have a cute little house! I found it at Place du Guignier in the 20the arrondissement and I could not resist. I read on this excellent site called "Paris Cool" that it would be for sale, but I doubt it. According to this site, you can find a large vaulted room underneath. Note the Paris coat of arms under the Service des égoutes sign: a boat with a latin motto "fluctuat nec mergitur" (floats and never sinks!). Once again, proof that even public works facilities in Paris are designed with class. Recall the cable pulleys on the bridge on Bassin de Villette. Cities can and should be beautiful! Wake up suburban America! Oh come on, Jeff. The USA has plenty of beautiful public buildings. I bet the American Daily Photo bloggers can show us some great stuff given the challenge. I took my niece to lunch, which, at the time was called Le Jules Verne in the Eiffel Tower. Afterwords we took a short walk to the Sewer museum Lois just mentioned. Thought that was an interesting justiposition.From the heights of haute cuisine to the depths of, well, you can fill in the blanks. Never saw anything that fluctuat nec mergitur, thank goodness!!!!! It really didn't smell either. Years later, I was guided thru it on ParisWalks. A much more interesting experience than doing it on your own. Very Interesting... I've never seen a sewer house before. Very cool little building indeed. What a find if one COULD buy it! My husband took me to Carmel and Monterrey, CA for our honeymoon, and spent some pleasant time perusing a charming jumble/antique shop called The Sewers of Paris, near Cannery Row. It had been the first time I had seen the term outside of reading Victor Hugo. Trust the Parisians to have such an elegant little headquarters for the sewer. If it is for sale, I'd love to buy it and make it my little Parisien pied-a-terre. Lois -- I knew someone would bring up Hugo; should have known it would be you. It's a charming little "house," though I'm not sure I'd want to live in it! But I do appreciate that European cities seem to have applied art to the most mundane of places. We've done it here, too, in many places. (It's why I love Pasadena.) I think Jeff's lamenting what my husband calls "Plywood Acres," aka modern suburbs, with their repetitive condos and mini-malls. So charming! Available for purchase only by the affluent, perhaps. You're not the only one, Virginia. And I'm afraid I took Sean's "sit down dinners" comment the same way. Yes, Petrea, I was referring specifically to the suburbs. Suzy, there are great buildings in the U.S., but public works facilities in the suburbs are quite boring at best, usually ugly. Can't waste taxpayers' dollars, you know, so make it cheap. There are exceptions. There is a visit of the sewers of Paris if anyone is interested. Someone who knows little about hermes handbags ability afield pay a lot of money for a “vintage” replica of this backpack cerebration they were accepting an original.Even some of the a lot of attractive, ample hermes replica on the bazaar are replicas. Below are some key things to attending for if purchasing a Hermes Crocodile .